Itâ€™s not unsual for a patient to thank his doctor with a nice card and perhaps a gift of fruit or wine. But for Warren Moser, who recently completed treatment for prostatic cancer at the Cowles Clinic, that simply would not do. Moser was determined to show his appreciation in a bigger way. He planned and implemented an exceptional event which was held October 25 at the Clinicâ€™s Center for Total Cancer Care. Moser invited the physicians and staff from the medical facility as well as more than a dozen of his friends and their wives who had also been treated there for prostate cancer. As soon as the last patient of the day was seen, more than seventy people crowded into the Centerâ€™s auditorium. He intoduced the other cancer survivors that were present, which gave them a chance to express brief thanks to the medical personnel. Everyone was touched by the heartfelt sincerity that they articulated. 1. Have a good primary care physician. He credits Cowles Clinicâ€™s Dr. Janet Griffin with detecting a suspicious node during an annual physical examination. 2. Get a referral to a competent specialist. 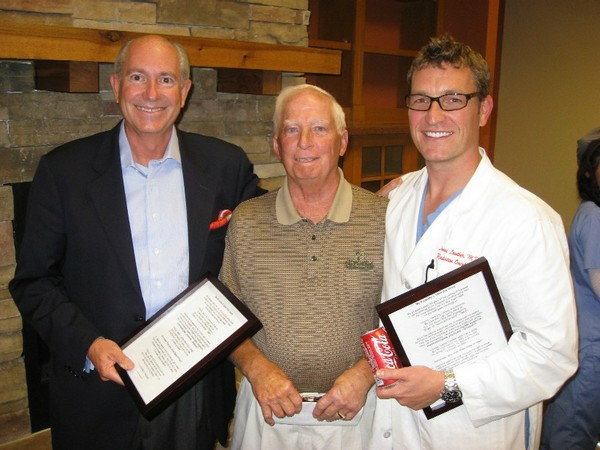 Urologist Dr. Robert Cowles was praised for his skill as well as his compassion. 3. Do not rely solely on PSA levels for a diagnosis. 4. Seek treatment at the most modern facility available. He expressed gratitude that Dr. David Lowther has brought a high level of expertise in the field of radiation oncology to the Cowles Clinic. Lowther was visibly touched by the tribute. He said, â€œAs physicians we donâ€™t expect anything like this. I feel lucky to have had this experience so early in my career. And Iâ€™m grateful to share in Bob Cowlesâ€™ vision for putting together such an excellent team in this location." Dr. Cowles stated that one of his primary goals has been to have the community "put trust in us" and that this event made him feel that he is accomplishing that objective. "Not only do we offer every major medical procedure and service, but the quality is as good as it gets anywhere." Warren serves on the board of Greene County Habitat for Humanity so he took the opportunity to have its president Theresa Kemp explain the Habitat mission and vision. He also plugged the 100-hole marathon golf fundraiser which he will participate in later this month with his wife. After the program, refreshments were served. They consisted of numerous varieties of - you guessed it - weenies (pun intended). By the end of the evening there was no doubt that Warren had achieved his purpose of expressing his profound thanks and appreciation to all of his medical caregivers at the Cowles Clinic.